Marcus Ulpius Nerva Traianus (September 18, 53 - August 9, 117), Roman Emperor (98-117), commonly called Trajan, was the second of the so-called "Five Good Emperors" of the Roman Empire. Under his rule, the Empire reached its greatest territorial extent. Born into a non-patrician family in the province of Hispania Baetica, Trajan rose to prominence during the reign of emperor Domitian. Serving as a legatus legionis in Hispania Tarraconensis, in 89 Trajan supported the emperor against a revolt on the Rhine led by Antonius Saturninus. In September 96, Domitian was succeeded by Marcus Cocceius Nerva, an old and childless senator who proved to be unpopular with the army. After a brief and tumultuous year in power, a revolt by members of the Praetorian Guard compelled him to adopt the more popular Trajan as his heir and successor. Nerva died on 27 January 98, and was succeeded by his adopted son without incident. As a civilian administrator, Trajan is best known for his extensive public building program which reshaped the city of Rome and left multiple enduring landmarks such as Trajan's Forum, Trajan's Market and Trajan's Column. Early in his reign, he annexed the Nabataean kingdom, creating the province of Arabia Petraea. His conquest of Dacia enriched the empire greatly - the new province possessed many valuable gold mines. His war against the Parthian Empire ended with the attack of the capital Ctesiphon and the annexation of Armenia and Mesopotamia. His campaigns expanded the Roman Empire to its greatest territorial extent. In late 117, while sailing back to Rome, Trajan fell ill and died of a stroke in the city of Selinus. He was deified by the Senate and his ashes were laid to rest under Trajan's Column. He was succeeded by his adopted son Hadrian. As an emperor, Trajan's reputation has endured - he is one of the few rulers whose reputation has survived nineteen centuries. Every new emperor after him was honored by the Senate with the wish felicior Augusto, melior Traiano ("be luckier than Augustus and better than Trajan"). Among medieval Christian theologians, Trajan was considered a virtuous pagan, while the 18th century historian Edward Gibbon popularized the notion of the Five Good Emperors, of which Trajan was the second. Marcus Ulpius Traianus was born in the Roman province of Hispania Baetica (in what is now Andalusia in modern Spain), a province that was thoroughly Romanized and called southern Hispania, in the city of Italica (now in the outskirts of Seville), where the Italian families were paramount. Of Italian stock himself, Trajan is frequently but misleadingly designated the first provincial emperor. Trajan was the son of Marcia and Marcus Ulpius Traianus, a prominent senator and general from the gens Ulpia. Trajan himself was just one of many well-known Ulpii in a line that continued long after his own death. His elder sister was Ulpia Marciana and his niece was Salonina Matidia. 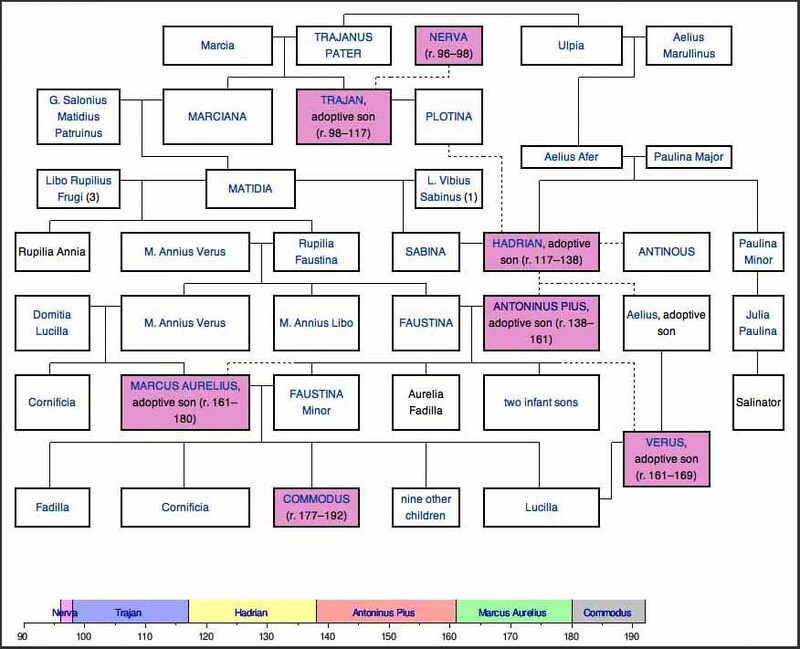 The patria of the Ulpii was Italica, in Spanish Baetica, where their ancestors had settled late in the 3rd century BC. As a young man, he rose through the ranks of the Roman army, serving in some of the most contentious parts of the Empire's frontier. In 76-77, Trajan's father was Governor of Syria (Legatus pro praetore Syriae), where Trajan himself remained as Tribunus legionis. Trajan was nominated as Consul and brought Apollodorus of Damascus with him to Rome around 91. Along the Rhine River, he took part in the Emperor Domitian's wars while under Domitian's successor, Nerva, who was unpopular with the army and needed to do something to gain their support. 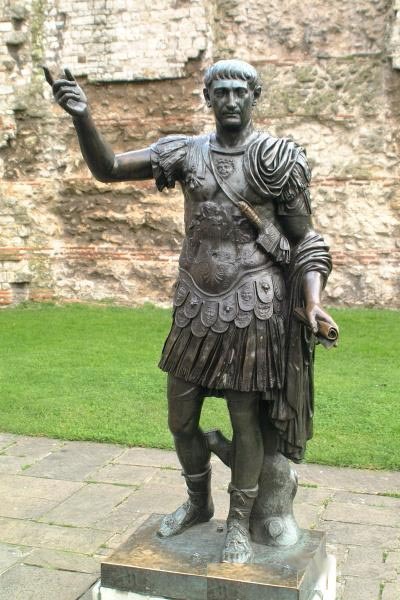 He accomplished this by naming Trajan as his adoptive son and successor in the summer of 97. According to the Augustan History, it was the future Emperor Hadrian who brought word to Trajan of his adoption. When Nerva died on 27 January 98, the highly respected Trajan succeeded without incident. The new Roman emperor was greeted by the people of Rome with great enthusiasm, which he justified by governing well and without the bloodiness that had marked Domitian's reign. He freed many people who had been unjustly imprisoned by Domitian and returned a great deal of private property that Domitian had confiscated (a process that had been begun by Nerva). His popularity was such that the Roman Senate eventually bestowed upon Trajan the honorific of optimus, meaning "the best". It was as a military commander that Trajan is best known to history, particularly for his conquests in the Near East, but initially for the two wars against Dacia - the reduction to client kingdom (101Ð102), followed by actual incorporation into the Empire of the trans-Danube border kingdom of Dacia - an area that had troubled Roman thought for over a decade with the unfavourable (and to some, shameful) peace negotiated by Domitian's ministers. In the first military campaign c. March-May 101, Trajan launched a victorious attack into the Dacian Kingdom crossing to the northern bank of the Danube River and defeating the Dacian army at Tapae near the Iron Gates of Transylvania. Trajan's troops were mauled in the encounter, however and he put off further campaigning for the year to let the troops heal, reinforce, and regroup. During the following winter, King Decebalus launched a counter-attack across the Danube further downstream, but this was repulsed. Trajan's army advanced further into Dacian territory and forced King Decebalus to submit to him a year later. Trajan returned to Rome in triumph and was granted the title Dacicus Maximus. The victory was celebrated by the Tropaeum Traiani. Decebalus, though, after being left to his own devices, in 105 undertook an invasion against Roman territory by attempting to stir up some of the tribes north of the river against the empire. Trajan took to the field again and after building, with the design of Apollodorus of Damascus, his massive bridge over the Danube, he conquered part of Dacia in 106. After a fierce campaign (see also Second Dacian War), the Dacian capital, Sarmizegetusa Regia, was destroyed. Decebalus fled but, rather than being captured by the Roman cavalry, committed suicide, and his severed head was exhibited in Rome on the steps leading up to the Capitol. Trajan built a new city, Colonia Ulpia Traiana Augusta Dacica Sarmizegetusa, on another site than the previous Dacian Capital, although bearing the same full name, Sarmizegetusa. Trajan also reformed the infrastructure of the Iron Gates region of Danube. Built around 103 to 105, Trajan's Bridge, or Pontes, is considered an architectural marvel, at 3,500 feet across. He either commissioned the creation or enlargement of the road along the Iron Gates carved into the side of the gorge. Additionally, Trajan commissioned a canal to be built around the rapids of the Iron Gates. Evidence of this comes from a marble slab discovered near Caput Bovis, the site of a Roman fort. It can be dated to the year 101 and commemorates the building of at least one canal that went from the Kasajna tributary to at least Ducis Pratum, whose embankments were still visible until recently. However, the placement of the slab at Caput Bovis suggests that the canal extended to this point or that there was a second canal downriver of the Kasajna-Ducis Pratum one. Trajan resettled Dacia with Romans and annexed it as a province of the Roman Empire. 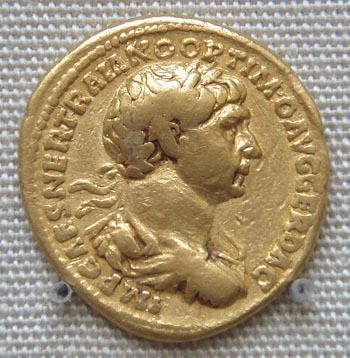 Trajan's Dacian campaigns benefited the Empire's finances through the acquisition of Dacia's gold mines. The victory has been commemorated by the construction of Trajan's Column, which depicts in stone carved basreliefs the Dacian Wars' most important moments. At about the same time Rabbel II Soter, one of Rome's client kings, died. This event might have prompted the annexation of the Nabataean kingdom, although the manner and the formal reasons for the annexation are unclear. Some epigraphic evidence suggests a military operation, with forces from Syria and Egypt. What is known is that by 107, Roman legions were stationed in the area around Petra and Bostra, as is shown by a papyrus found in Egypt. The furthest south the Romans occupied was Hegra, over 300 km south-west of Petra. The empire gained what became the province of Arabia Petraea (modern southern Jordan and north west Saudi Arabia). The next seven years, Trajan ruled as a civilian emperor, to the same acclaim as before. It was during this time that he corresponded with Pliny the Younger on the subject of how to deal with the Christians of Pontus, telling Pliny to leave them alone unless they were openly practicing the religion. He built several new buildings, monuments and roads in Italia and his native Hispania. His magnificent complex in Rome raised to commemorate his victories in Dacia (and largely financed from that campaign's loot) - consisting of a forum, Trajan's Column, and Trajan's Market still stands in Rome today. He was also a prolific builder of triumphal arches, many of which survive, and rebuilder of roads (Via Traiana and Via Traiana Nova). In 107 he devalued the Roman currency. He decreased the silver purity of the denarius from 93.5% to 89% - the actual silver weight dropping from 3.04 grams to 2.88 grams. This devaluation, coupled with the massive amount of gold and silver carried off after Trajan's Dacian Wars, allowed the emperor to mint a larger quantity of denarii than his predecessors. One notable act of Trajan during this period was the hosting of a three-month gladiatorial festival in the great Colosseum in Rome (the precise date of this festival is unknown). Combining chariot racing, beast fights and close-quarters gladiatorial bloodshed, this gory spectacle reputedly left 11,000 dead (mostly slaves and criminals, not to mention the thousands of ferocious beasts killed alongside them) and attracted a total of five million spectators over the course of the festival. Another important act was his formalization of the Alimenta, a welfare program that helped orphans and poor children throughout Italy. It provided general funds, as well as food and subsidized education. The program was supported initially by funds from the Dacian War, and then later by a combination of estate taxes and philanthropy. Although the system is well documented in literary sources and contemporary epigraphy, its precise aims are controversial and have generated considerable dispute between modern scholars. Usually, it's assumed that the program was intended to bolster citizen numbers in Italy. However, the fact that it was subsidized by means of interest payments on loans made by landowners restricted it to a small percentage of potential welfare recipients (Paul Veyne has assumed that, in the city of Veleia, only one child out of ten was an actual beneficiary) - therefore, the idea, advanced by Moses I. Finley, that the whole scheme was at most a form of random charity, a mere imperial benevolence. In 113, he embarked on his last campaign, provoked by Parthia's decision to put an unacceptable king on the throne of Armenia, a kingdom over which the two great empires had shared hegemony since the time of Nero some fifty years earlier. Some modern historians also attribute Trajan's decision to wage war on Parthia to economic motives: to control, after the annexation of Arabia, Mesopotamia and the coast of the Persian Gulf, and with it the sole remaining receiving-end of the Indian trade outside Roman control. Other historians reject this motive, seeing the campaign as triggered by the lure of territorial annexation and prestige, the motive ascribed by Cassius Dio. Other modern historians, however, think that Trajan's original aim was quite modest: to assure a more defensible Eastern frontier for the Roman Empire, crossing across Northern Mesopotamia along the course of the Khabur River in order to offer cover to a Roman Armenia. Trajan marched first on Armenia, deposed the Parthian-appointed king (who was afterwards murdered while kept in the custody of Roman troops in an unclear incident) and annexed it to the Roman Empire as a province, receiving in passing the acknowledgement of Roman hegemony by various tribes in the Caucasus and on the Eastern coast of the Black Sea - a process that kept him busy until the end of 114. The chronology of subsequent events is uncertain, but it's generally believed that early in 115 Trajan turned south into the core Parthian hegemony, taking the Northern Mesopotamian cities of Nisibis and Batnae and organizing a province of Mesopotamia in the beginning of 116, when coins were issued announcing that Armenia and Mesopotamia had been put under the authority of the Roman people. In early 116, however, Trajan began to toy with the conquest of the whole of Mesopotamia, an overambitious goal that eventually backfired on the results of his entire campaign: One Roman division crossed the Tigris into Adiabene, sweeping South and capturing Adenystrae; a second followed the river South, capturing Babylon; while Trajan himself sailed down the Euphrates, then dragged his fleet overland into the Tigris, capturing Seleucia and finally the Parthian capital of Ctesiphon. He continued southward to the Persian Gulf, receiving the submission of Athambelus, the ruler of Charax, whence he declared Babylon a new province of the Empire, sent the Senate a laurelled letter declaring the war to be at a close and bemoaning that he was too old to go on any further and repeat the conquests of Alexander the Great A province of Assyria was also proclaimed, apparently covering the territory of Adiabene, as well as some measures seem to have been considered about the fiscal administration of the Indian trade. However, as Trajan left the Persian Gulf for Babylon - where he intended to offer sacrifice to Alexander in the house where he had died in 323 BC. - a sudden outburst of Parthian resistance, led by a nephew of the Parthian king, Sanatrukes, imperilled Roman positions in Mesopotamia and Armenia, something Trajan sought to deal with by forsaking direct Roman rule in Parthia proper, at least partially. Later in 116, after defeating a Parthian army in a battle where Sanatrukes was killed and re-taking Seleucia, he formally deposed the Parthian king Osroes I and put his own puppet ruler Parthamaspates on the throne. That done, he retreated North in order to retain what he could of the new provinces of Armenia and Mesopotamia. It was at this point that Trajan's health started to fail him. The fortress city of Hatra, on the Tigris in his rear, continued to hold out against repeated Roman assaults. He was personally present at the siege and it is possible that he suffered a heat stroke while in the blazing heat. Shortly afterwards, the Jews inside the Eastern Roman Empire rose up in rebellion once more, as did the people of Mesopotamia. Trajan was forced to withdraw his army in order to put down the revolts. Trajan saw it as simply a temporary setback, but he was destined never to command an army in the field again, turning his Eastern armies over to the high ranking legate and governor of Judaea, Lusius Quietus, who in early 116 had been in charge of the Roman division who had recovered Nisibis and Edessa from the rebels. Quietus was promised a consulate in the following year (118 AD) for his victories but he was murdered before this could occur. It has been theorized that Quietus was executed on the orders of the new emperor, Hadrian, for fear of Quietus' popular standing with the army and his close connections to Trajan. Early in 117, Trajan grew ill and set out to sail back to Italy. His health declined throughout the spring and summer of 117, something publicly acknowledged by the fact that a bronze bust displayed at the time in the public baths of Ancyra showed him clearly aged and emaciated. By the time he had reached Selinus in Cilicia which was afterwards called Trajanopolis, he suddenly died from edema on 9 August. Some say that he had adopted Hadrian as his successor, but others that it was his wife Pompeia Plotina who hired someone to impersonate him after he had died. Hadrian's first act as emperor was to abandon the distant and indefensible Mesopotamia and restore Armenia - as well as Osroene Ð to the Parthian hegemony under Roman suzerainty. However, all the other territories conquered by Trajan were retained. 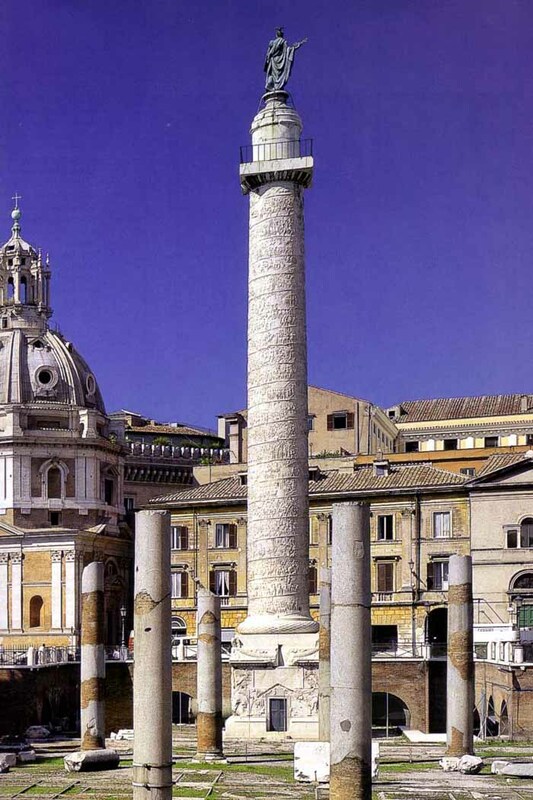 Trajan's ashes were laid to rest underneath Trajan's column, the monument commemorating his success. Trajan was a prolific builder in Rome and the provinces, and many of his buildings were erected by the gifted architect Apollodorus of Damascus. Notable structures include Trajan's Column, Trajan's Forum, Trajan's Bridge, (see below) Alcantara Bridge, the road and canal around the Iron Gates, and possibly the Alconetar Bridge. In order to build his forum and the adjacent brick market that also held his name Trajan had vast areas of the surrounding hillsides leveled. 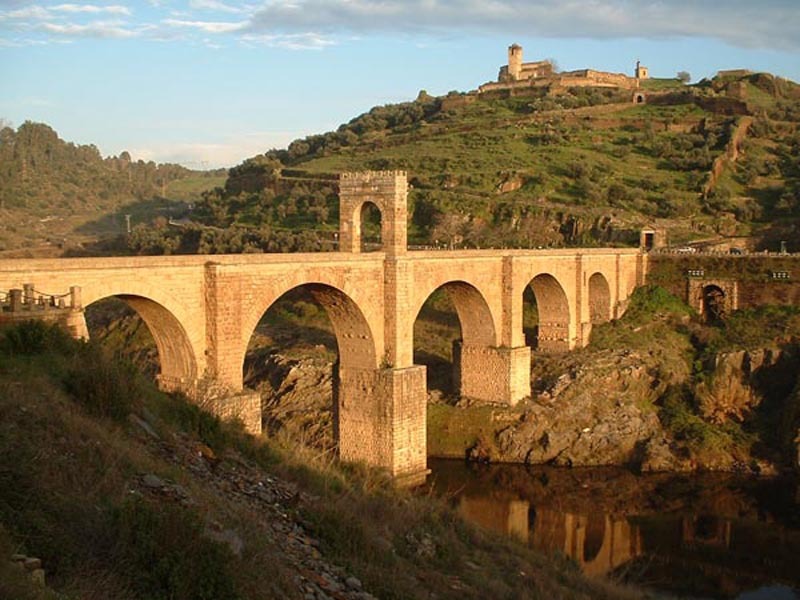 Alconetar Bridge was a Roman segmental arch bridge in the Extremadura region, Spain. The ancient structure, which featured flattened arches with a span-to-rise ratio of 4-5:1, is one of the earliest of its kind. Due to its design, it is assumed that the bridge was erected in the early 2nd century AD by the emperors Trajan or Hadrian, possibly under the guidance of Apollodorus of Damascus, the most famous architect of the time. The almost 300 m long Alconetar Bridge served as a crossing point for the Roman Via de la Plata, the most important north-south connection in western Hispania, over the Tagus, the longest river of the Iberian peninsula. It presumably remained in service until the Reconquista, numerous early modern reconstruction attempts by Spanish engineers failed. The ruins, which were mainly to be found on the right river bank, were relocated from its original position in 1970, when the Alcantara reservoir was created. 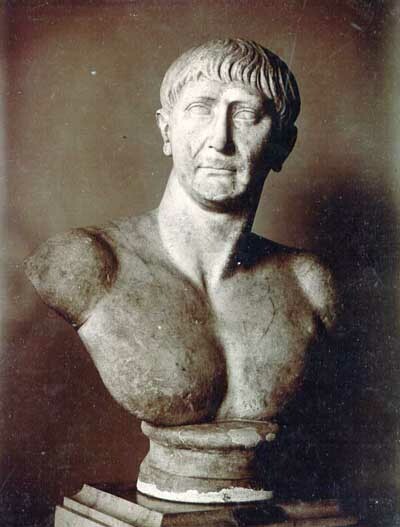 Unlike many lauded rulers in history, Trajan's reputation has survived undiminished for nearly nineteen centuries. Ancient sources on Trajan's personality and accomplishments are unanimously positive. Pliny the Younger, for example, celebrates Trajan in his panegyric as a wise and just emperor and a moral man. Dio Cassius added that he always remained dignified and fair. The Christianisation of Rome resulted in further embellishment of his legend: it was commonly said in medieval times that Pope Gregory I, through divine intercession, resurrected Trajan from the dead and baptized him into the Christian faith. An account of this features in the Golden Legend. Theologians, such as Thomas Aquinas, discussed Trajan as an example of a virtuous pagan. In the Divine Comedy, Dante, following this legend, sees the spirit of Trajan in the Heaven of Jupiter with other historical and mythological persons noted for their justice. Also a mural of Trajan stopping to provide justice for a poor widow is present in the first terrace of Purgatory as a lesson to those who are purged for being proud. He also features in Piers Plowman. An episode, referred to as the justice of Trajan was reflected in several art works. In the 18th century King Charles III of Spain commissioned Anton Raphael Mengs to paint The Triumph of Trajan on the ceiling of the banqueting-hall of the Royal Palace of Madrid - considered among the best work of this artist. "Traian" is used as a male first name in present-day Romania - among others, that of the country's current president, Traian Basescu. Trajan's Forum is an ancient structure in Rome, Italy, chronologically the last of the Imperial fora. The forum was constructed by the architect Apollodorus of Damascus. This forum was constructed on the order of Emperor Trajan with the spoils of war from the conquest of Dacia, which ended in 106. The Fasti Ostienses states that the Forum was inaugurated in 112, while Trajan's Column was erected and then inaugurated in 113. To build this monumental complex, extensive excavations were required: workers eliminated the sides of the Quirinal and Capitoline (Campidoglio) Hills, which closed the valley occupied by the Imperial forums toward the Campus Martius. It is possible that the excavations were initiated under Emperor Domitian, while the project of the Forum was completely attributed to the architect Apollodorus of Damascus, who also accompanied Emperor Trajan in the Dacian campaign. During the time of the construction, several other projects took place: the construction of the Markets of Trajan,and the renovation of the Caesar's Forum (where the Basilica Argentaria was built) and the Temple of Venus Genetrix. 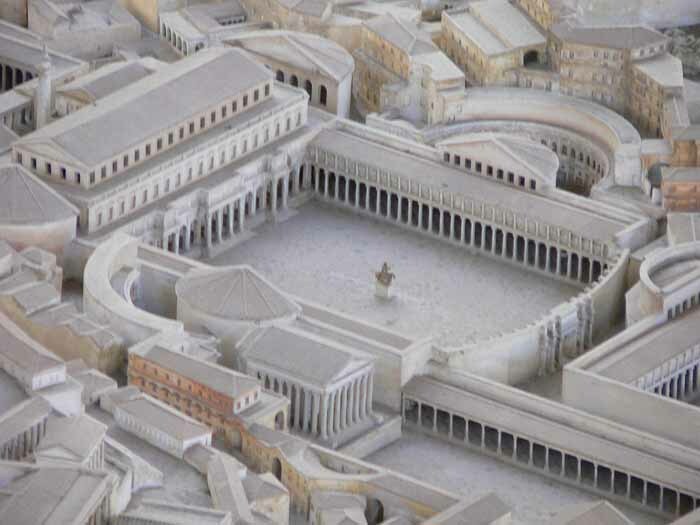 The Forum was built from a vast stoa-lined piazza measuring 200 x 120 m with exedrae on two sides. The main entrance to the forum is on the southern side, a triumphal arch surmounted by a statue of Trajan in a six-horse chariot. The Basilica Ulpia lies at the north end of the piazza, which was cobbled with rectangular blocks of white marble and decorated by a large equestrian statue of Trajan. On either side of the piazza are markets, also housed by the exedrae. North of the Basilica was a smaller piazza, with a temple dedicated to the deified Trajan on the far north side facing inwards. Directly north of the Basilica Ulpia on either side of the forum were two libraries, one housing Latin documents and the other Greek documents. Between the libraries was the 38 m Trajan's Column. Trajan's Bridge, or Bridge of Apollodorus over the Danube was a Roman segmental arch bridge, the first to be built over the lower Danube. Though it lasted fewer than 200 years before being destroyed, for more than 1,000 years it was the longest arch bridge in both total and span length. The bridge was constructed by the Greek architect Apollodorus of Damascus for the deployment of Roman troops in the war against Dacia, in 105 AD. The bridge was situated East of the Iron Gates, near the cities of Drobeta-Turnu Severin (Romania) and Kladovo (Serbia). Its construction was ordered by Emperor Trajan as a supply route for the Roman legions fighting in Dacia. The structure was 1,135 m (3,724 ft) in length (the Danube is 800 m (2,600 ft) wide in that area), 15 m (49 ft) in width, and 19 m (62 ft) in height (measured from the river's surface). At each end was a Roman castrum, each built around an entrance (crossing was possible only by walking through the camp). Its engineer, Apollodorus of Damascus, used wooden arches set on twenty masonry pillars (made of bricks, mortar and pozzolana cement) that spanned 38 m (125 ft) each. It was built unusually quickly (between 103 and 105)-one possible explanation is that the river was diverted during construction. The bridge was destroyed by Aurelian, after the Roman Empire withdrew its troops from Dacia. The twenty pillars were still visible in 1856, when the level of the Danube hit a record low. In 1906, the International Commission of the Danube decided to destroy two of the pillars that were obstructing navigation. In 1932, there were 16 remaining pillars underwater, but in 1982 only 12 were mapped by archeologists; the other four had probably been swept away by water. Only the entrance pillars are now visible on either bank of the Danube. In 1979, Trajan's Bridge was added to the Monument of Culture of Exceptional Importance, and in 1983 on Archaeological Sites of Exceptional Importance list, and by that it is protected by Republic of Serbia. Trajan's Market is a large complex of ruins in the city of Rome, Italy, located on the Via dei Fori Imperiali, at the opposite end to the Colosseum. The surviving buildings and structures, built as an integral part of Trajan's Forum and nestled against the excavated flank of the Quirinal Hill, present a living model of life in the Roman capital and a glimpse at the continuing restoration in the city, which reveals new treasures and insights about Ancient Roman architecture. Thought to be the world's oldest shopping mall, the arcades in Trajan's Market are now believed by many to be administrative offices for Emperor Trajan. The shops and apartments were built in a multi-level structure, and it is still possible to visit several of the levels. Highlights include delicate marble floors and the remains of a library. Trajan's Market was probably built in 100-110 AD by Apollodorus of Damascus, an architect who always followed Trajan in his adventures and to whom Trajan entrusted the planning of his Forum, and inaugurated in 113 AD. During the Middle Ages the complex was transformed by adding floor levels, still visible today, and defensive elements such as the Torre delle Milizie, the "militia tower" built in 1200. 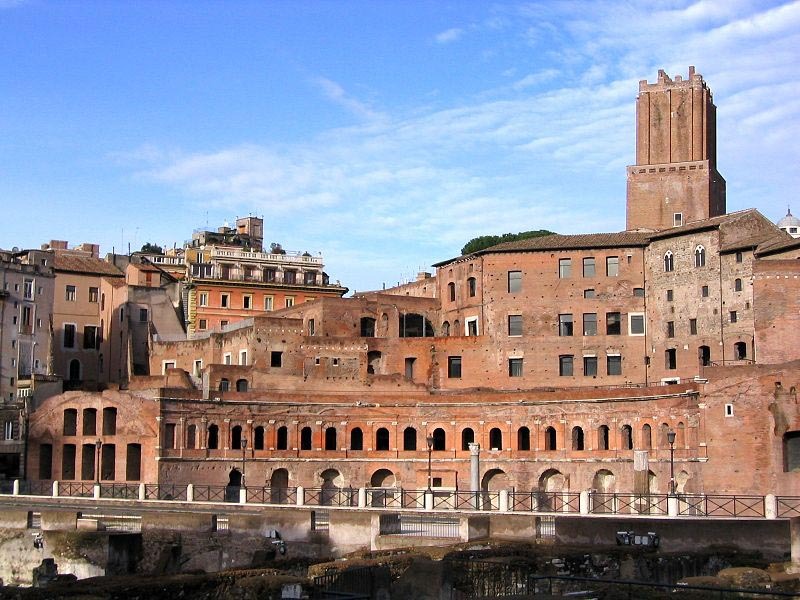 A convent, which was later built in this area, was demolished at the beginning of the twentieth century to restore Trajan's Markets to the city of Rome.